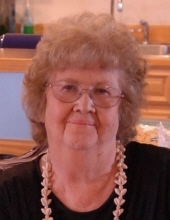 Panguitch, Utah - Darlene Clove Sawyer passed away February 2, 2019 after a full life of love and service. She was born October 16, 1934 in Panguitch, Utah to Neils Ivor and Dora Ann Justet Clove. She graduated from Panguitch High School as an honor student and spoke at the Commencement exercises. was solemnized in the St. George Temple on September 27, 1962. Darlene raised her six boys and had to learn to love hunting, fishing although she always loved the outdoors and camping. She had a love for all of God's creatures. Darlene had a green thumb and had lush gardens that produced lots of food for canning. She loved a competitive game of Pinochle with friends and family. Darlene had a huge heart that was full of a 'Love thy neighbor" attitude, a forgiving nature and unconditional love for everyone who was blessed enough to be in her life. She was a caretaker of too many to list. Darlene and Lyle's love and devotion for each other in their marriage has always been an example to strive for. As her health declined these past few years, Lyle has been a dedicated and loving caregiver. She had such a special place in her heart for her grandchildren and great grandchildren and developed a close bond with each one individually. Darlene was a member of the Hatch ward and served in many callings. A special calling that was dear to her heart was serving in the temple with her eternal companion. She will be greatly missed. Darlene has left us a great legacy, because she lived her life in service and love. She was an angel among us here on earth and we will now look to her to be our guardian angel. Darlene was preceded in death by her parents Neils Ivor Clove and Dora Ann Justet, sister Neilene (M.kay) Haywood, and brother Vene J. "Tim" Clove. She is survived by her loving husband Lyle Arthur Sawyer, her sons Ricky (Susan) Sawyer, Arlin (Connie) Sawyer, Verneil Sawyer, Kenneth (Lynette) Sawyer, Wayne (Sherron) Sawyer, Duane (Helen) Sawyer, and sister in law Beverly Chandler, 21 grandchildren and 25 great grandchildren. Funeral Services will be held on Saturday, February 9, 2019 at 12 Noon. in the Hatch LDS Ward Chapel where friends may call for viewing Friday evening from 6 to 8 P.M. or Saturday morning from 10:30 to 11:30 prior to the services. Burial will be in the Panguitch City Cemetery under the care of the Springer Turner Funeral Home of Richfield and Salina, Utah. To send flowers or a remembrance gift to the family of Darlene Clove Sawyer, please visit our Tribute Store. "Email Address" would like to share the life celebration of Darlene Clove Sawyer. Click on the "link" to go to share a favorite memory or leave a condolence message for the family.